Located on the future site of the Mystic River Boathouse Park, the Stonington Community Rowing Center (SCRC) will offer rowing programs for people of all ages and abilities. Operating from the Hart Perry Boathouse, the center will provide the benefits of competitive, recreational, and adaptive rowing including teamwork, dedication, fitness, and water safety. SCRC will also provide access to the Mystic River for non-motorized watercraft and marine education programs. Aerial photograph of the site secured by the Town of Stonington for the Mystic River Boathouse Park and the Stonington Community Rowing Center. The Friends of Stonington Crew would like to thank you for your generous support of the Stonington Community Rowing Center and Hart Perry Boathouse Capital Campaign. We have raised over $430,000 toward our goal of $2.5 million and we are very grateful for your contribution! Help Us Make Community Rowing A Reality! 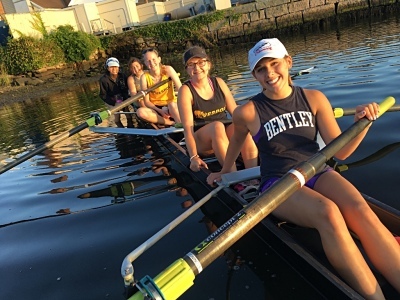 Please help us fulfill the vision shared by Hart Perry, the Stonington community, and Stonington High School Crew Team, by making your donation today. Click the Donate button below to get started!